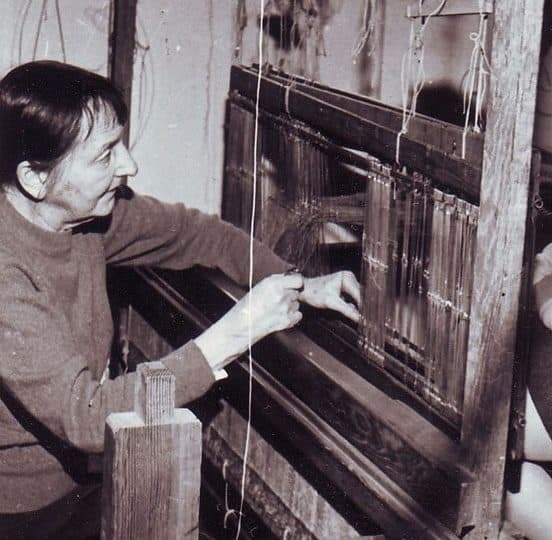 Anni Albers was one of the first bodies of work I was introduced to when starting my own woven textile degree, her book ‘On weaving’ a seminal text. Albers studied at the Bauhaus in 1922 and discouraged from the male painting domain she found herself in the weaving workshop. The present art and design education system allows some time for experimentation in the disciplines before specialising. Despite this introduction and students being encouraged on aptitude a gendered tendency remains between fine art and design craft. Early on we were asked to question ourselves; ‘Are you an artist or designer?’ art to me has always been an expression, mood or feeling, the powerful need to create. Design incorporates this but with more focus and reward on functional, communicative design aesthetic. Of course the two are not exclusive and Albers endures as an interdisciplinary. Craft or decorative arts can be viewed as the grounding of society, indeed Albers believed this and the Tate exhibition includes examples of historic textiles that Albers had collected and studied from all around the world and more often than not undertaken by men. Amber Butchart further explores the relationship between the gendered issue of art and craft in her own article. Weaving is a time consuming process and success hinges on advance planning and considered outcomes. Weaving exists within the fixed parameters of a matrix of threads with designs and constructions working in geometric and mathematical patterns. Albers vision and skill lay in her ability to manipulate the machinery to draw in a more expressive way. She exploited the inherent properties of yarn and material to create texture, surface, interplay and colour. Albers often planned out her ideas on paper but still applied the constraints of weaving to her freehand work, making them essentially geometric but with an organic quality. These studies act as a guide for colour, texture and woven construction on the loom. The images below show a graphite exploration and then a similar woven sample. For woven textile designers and practitioners the exhibition contained the recognisable language of design that we are so familiar with. Neatly drawn weave constructions depicting ends and picks can be read like sheet music or computer code, exactly mapping out the story to unfold ahead. They start out as purely functional instructions but become attractive patterns within themselves. There is a comradery between hand weavers that transcends generations and underpins the relationship between the weaver and the loom. There is a strong physical connection formed through hours, months and years of warping, threading, shuttling and weaving which was beautifully highlighted by the inclusion of looms book-ending the start and finish of the exhibition.